We are on the road 21 April and will return to ship 30 April. This effects the shipping of physical goods, downloads will be delivered at the time of purchase. Please contact fcbd@fcbd.com with any questions. In 1995, Liz began her journey into belly dance on a whim by walking into a class with a friend. The empowering spirit of the dance and fellowship hooked her immediately and it wasn’t long before she co-founded a Middle Eastern dance company with fellow dance sisters. Zivah Saphirah specialized in studying and performing Egyptian cabaret and folkloric dances. Liz loved the way she felt when she danced but found self-confidence a constant challenge. Upon discovering American Tribal Style (ATS)® she was drawn to the strong and powerful aesthetic of the format but there were no classes available in the city. Not to be thwarted, Liz spent several years studying all the ATS® videos and materials she could get her hands on. In 1999 Liz’s prayers were answered when Megha returned to Birmingham. Liz began taking classes with Megha and her love for the dance blossomed. Her experience leading a dance company and dedication to ATS® led to an invitation to join Devyani Dance Company in 2004. Since then, she has had the pleasure of teaching and performing ATS®throughout the United States. Through the dance Liz found a conduit for self-confidence and she set out to share it with as many people as she could. She received her American Tribal Style® General Skills and Teacher Certification in April 2007 followed by her Teacher Training 2 (TT2) Certification in 2009. She was honored to be accepted into the first Advanced Teacher Training in San Francisco and completed the two-week intensive in June 2015. 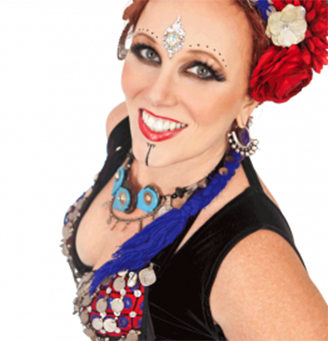 Currently Liz is sharing the gift of ATS®and the remarkable community it fosters by teaching weekly classes in Birmingham, Alabama as an ATS® belly dance Sister Studio CE(?) (SSCE) instructor and by lending her knowledge and skills to the position of assistant director of Devyani Dance Company and Dala (a local collective).